As the black currant bushes around my town home and out on my island begin to sprout the first aromatic leaves, I realize that it is time to use up my frozen berries from last year’s harvest. 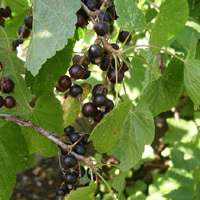 Black currant is regarded by many nutritionists as a wonderfood due to its high antioxidant content (meaning that they offer protection against free radicals which can damage cells and cause disease). The only question is how can you use them aside from in the standard, albeit wonderful, jam pot? Black currants have a strong flavor and can be more difficult to figure out how to use in bakes, etc. Recently I discovered a recipe for a black currant cake in one of my cookbooks, but I had to hesitate. Mounds of sugar, butter and white flour were required in order to produce this delicious-looking black currant creation. I summoned my courage and decided to make the cake with alterations. The result was divine and everyone liked it without exception. Preheat the oven to 175 C or 347 F. Grease a regular-sized pie dish. Blend the eggs and sugar until creamy. Add the flour and remain cake base ingredients. Blend. Pour into the pie dish. Scatter the black currants evenly across the top of the cake base. Follow with a layer of nuts. Scatter the sugar across the top and finally distribute the slabs of butter evenly. Bake approximately 30-35 minutes. The cake should not be entirely firm and retain some moisture in the middle. Allow to cool and enjoy in small pieces with tea or coffee. Remember that quantity and physical activity are key in being able to enjoy your desserts well!